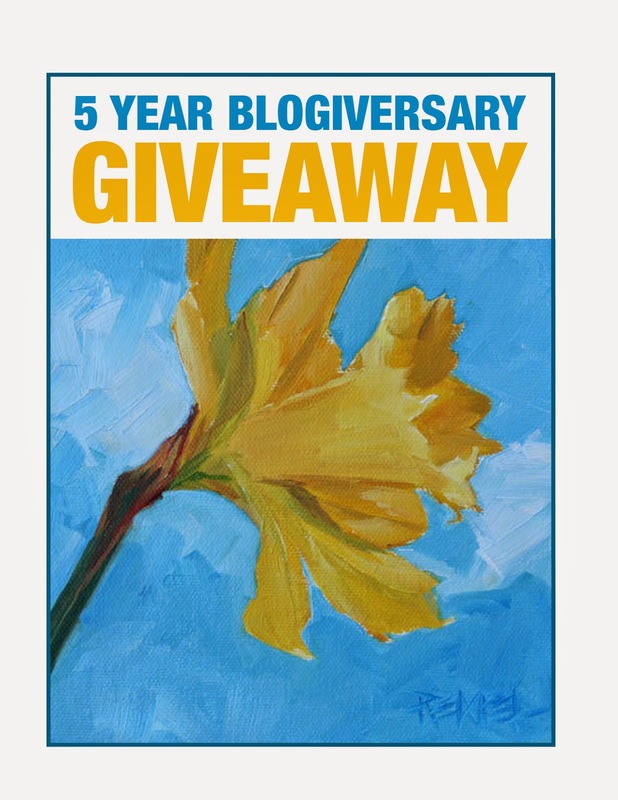 Eat Drink Paint • Kim Rempel: 5 Year Blogiversary Giveaway! So there are two different ways to enter. If you follow me on my blog (Eat Drink Paint) through Blogspot please leave a comment. If you follow me on Facebook at Kim Rempel Art, please "like" my page and share. That's it! The winner will be drawn Sunday night, June 8th using Random.org. This giveaway is open to EVERYONE! You do not need to live in Canada. Thanks again and good luck! You've inspired us as well, Kim. Happy Blogiversary - here's to 25 or 30 more years! All the best in the next five!!! I enjoy your art and blog. Thanks for this opportunity to own a Kim original. Happy Anniversary Kim! You are one of my artistic inspirations. Love your work. I need my Kim post every morning with my coffee. Congratulations on your anniversary. I LOVE seeing your daily paintings. I LOVE seeing your daily paintings... looking forward to seeing you next time I'm in Ontario. Happy Blogiversary Kim - loved watching as your work changed and morphed over the years. Very inspiring and very brave of you to share your experiments, your triumphs and your occasional frustrations with all of us. Happy blogging anniversary. I can't tell you how wonderful it has been meeting you, and following your blog and Facebook posts. I love your work, am inspired beyond belief at your creativity and the joy your blog gives to me and the world. Happy anniversary! There seems to be lots of giveaways going on at the moment - must be the season for it! I'm also doing one myself!